Industrial building corners take a daily beating, especially in heavy traffic areas. KSC Heavy-Duty Corner Protection provides an impact absorbing cushion from blows to corners by forklifts and other moving equipment. Constructed from EVA (Ethylene Vinyl Acetate) this heavy-duty corner protector provides an energy absorbing barrier that protects vehicles, vehicle drivers, and the underlying building structures. The bright yellow, soft EVA exterior construction protects vehicles from scratches and dents and is highly visible. This industrial strength corner protection stands 42" high and has a tapered design, hugging the corner while keeping a low profile. 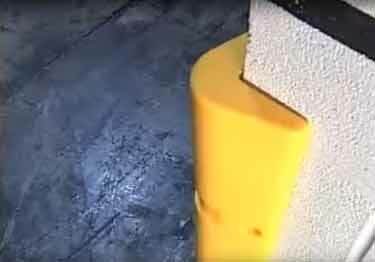 Corner guards can be installed with mechanical fasteners or with the cinch straps (sold separately) to square posts or concrete columns. Easily installed using standard concrete bolts and screws or adjustable cinch straps. Note: some users have reported attaching product using construction adhesive. It is highly recommended that if adhesive installation is preferred, an adhesive expert is consulted with regarding the use of adhesive on a polyethylene product and the particular substrate to which it will be attached, prior to installation. Integrated recessed grooves for cinch strap installation. (Straps not included). Industrial building corners take a daily beating, especially in heavy traffic areas. KSC Heavy-Duty Corner Protection provides an impact absorbing cushion from blows to corners by forklifts and other moving equipment. Reduce damage to pillar/column structures, & equipment with our Pillar & Column Wrap. Available in black or yellow. Reduce costly structural damage to walls & vehicles with KSC''s tough Wall Protection System. Easy to install, and customizable.